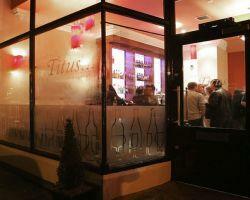 Don't Tell Titus01274 595633work Restaurant - PubWelcome to Don’t Tell Titus! A licensed Bar, Lounge & Restaurant in the heart of Saltaire village. Saltaire village was a planned community built by Titus Salt between 1850 and 1875 to house the workers at his new mill. The houses and facilities offered a great improvement on those in nearby Bradford at the time. Yet one thing was missing – as a nonconformist with sympathies for the temperance movement (and a keen sense of his own business interests) Salt made sure that there was no public house or saloon built in the village. Welcome to Don’t Tell Titus!